Overall Print Size: 34" x 24"
Of all the 4th Fighter Group's many famous actions in World War II, it saved one of the most remarkable till last. In its final major mission of the war on 16 April, 1945, in two blistering airfield attacks, its pilots destroyed no fewer than 105 enemy aircraft. While "A" Group attacked airfields in the region of Prague, "B" Group, consisting of the 334th Squadron led by Major 'Red Dog' Norley, devastated the Luftwaffe base at Gablingen in 40 minutes of continuous strafing. That same day other 8th Air Force fighter groups attacked Luftwaffe airfields all over Germany, claiming a total of 752 aircraft destroyed. The Luftwaffe never recovered from this terrible and devastating blow. 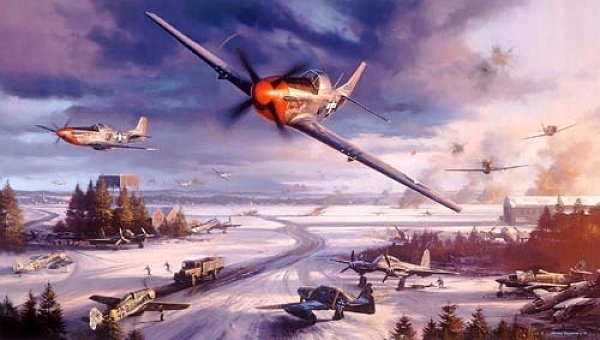 "MUSTANG MAYHEM" relives that momentous aerial assault in graphic detail with a superbly realistic view of the snow-covered Gablingen airfield in Bavaria. As 'Red Dog' Norley's P-51D screams across the field at hangar height with his squadron's Mustangs fanned out behind him, the 4th Fighter Group pilots jink through the intense ground fire wreaking havoc on the ground. In the foreground a couple of brave Fw190 pilots make a gallant attempt to get airborne while an assortment of Luftwaffe aircraft - ?Me262s, Me410s, Ju88s, Stukas, and Fw190s - come under fire. Ground personnel take cover as best they can. In the distance hangars and aircraft are on fire and a fuel dump has exploded. The painting is packed with action and all the accurate detail for which this talented artist has become so well known. In addition to the 334th's P-51s, there are over twenty aircraft visible on the ground, and the remains of others having been destroyed in earlier attacks. This is a must-have print for fans of the P-51 Mustang! Comes with a Certificate of Authenticity. © 2019 - Classic Aviation & War Art, LLC. All rights reserved.